If you’re a regular around these parts, you know that The Little Beet is an Ace customer and that we love them very much. 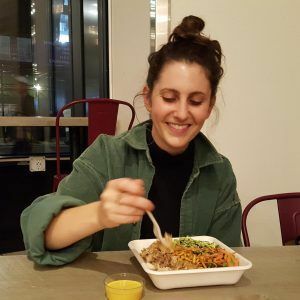 You most likely also know that they have a bomb location at The Pennsy, the fancy food hall by Penn Station, and that we reviewed it about a year ago. 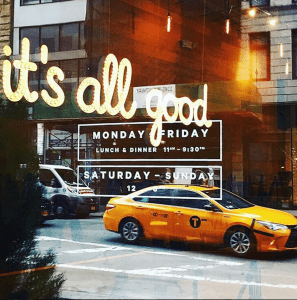 What you may not know is that they have many other restaurants–including spots in DC, Virginia, Long Island, and multiple locations throughout NYC–and they are all amazing! 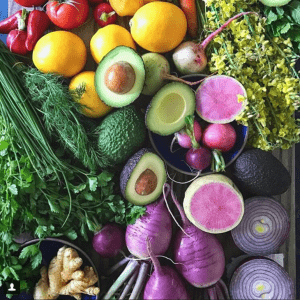 Keep reading to hear about our evening at The Little Beet on Broadway…and possibly experience some vicarious foodie thrills. 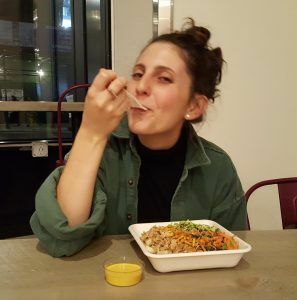 The Little Beet’s motto is “100% guiltin’ free,” which they take to the max by offering a 100% gluten-free menu boasting dishes made with fresh, seasonal, carefully sourced ingredients–all provided by vendors they trust. Wanting a fast, healthy meal on our way to a show, we stopped by The Little Beet’s Broadway location on a recent Friday night. Want to know a secret? 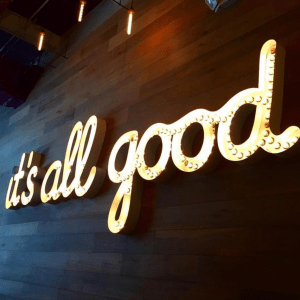 Yup, this may not be what they meant when they wrote it, but these letters, which light up The Little Beet’s wall in a magnificent display also apply to their food–it’s literally ALL GOOD. We didn’t taste a single thing during our visit that wasn’t fresh and delicious. So what did we order? Justine ordered the Brussel Hustle bowl, which is packed with chicken, shaved brussels sprouts, pecorino cheese, cranberry, avocado white bean spread, topped with salsa verde, and garnished with pickled onion. It’s served with a crunchy smattering of super seeds on top. 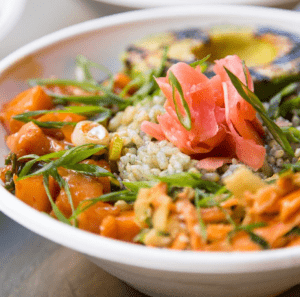 For the second bowl, we decided to build our own custom creation, which meant we got to choose a base, warm and cool veggies, a protein, a sauce, and garnishes. For the base, we went with 1/2 gluten-free ancient grains and 1/2 salad mix, topped with beets and lentils (think roasted & raw beets, black lentils, arugula and yuzu-maple dressing) and roasted kale (tossed with chickpeas, cranberries, and tahini). For the protein, we chose salmon poké, and asked our kind server to throw 1/2 a grilled avocado on top. He doused the bowl with ponzu sauce and garnished it with pickled ginger and hibiscus-pickled onions. Perfection. We also treated ourselves to two Rawmio Raw Chocolate Bars–dark chocolate infused with orange essential oil, which gave it a slightly fruity accent. 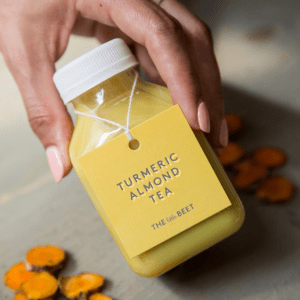 Curious about this new turmeric tea trend–have you noticed that everyone and their dog seems to be drinking it?–we also ordered a Little Beet original: house-made Turmeric Almond Tea. Sure enough, it was light and delicious! 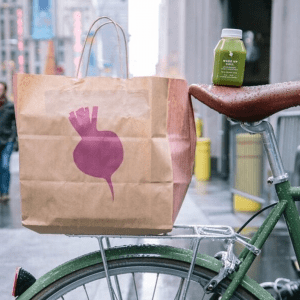 If you’re curious about The Little Beet, stop by one of their lovely NYC locations. Those of you who are always on the go will also be glad to know that this amazing eatery delivers. Visit their website to learn more. Happy eating!